This illiterate woman who lived in the Kozhuh Mountains of Bulgaria, made her prophetic warnings before her death in 1996. Among them were the 9-11 attack on the United States, the sinking of the Russian submarine Kursk, and that the forty-fourth president of the United States would be a black man. In my research I learned that she not only said our forty-forth president would be black, she warned that he also would be our last president. She predicted that at the time he stepped into office the nation would be struck by a severe economic crisis. And she was right; it was the crash of 2008. Her other predictions: After this president (Obama) left office there would be conflicts between the north and the south that would escalate and eventually bring down the United States as a great world power. China would then rise to be the world’s major economic and industrial power. Since Donald Trump and his cronies seized office the nation has become seriously divided, largely separating the northern and southern states but also separating the financial views of Conservative right-wing Republicans and Liberal Democrats. There also has developed a trove of Trump followers and a growing number of Americans who want this man removed from office. This conflict has been escalating to a point where it is dividing families and old friends, much as the nation was divided prior to the Civil War. 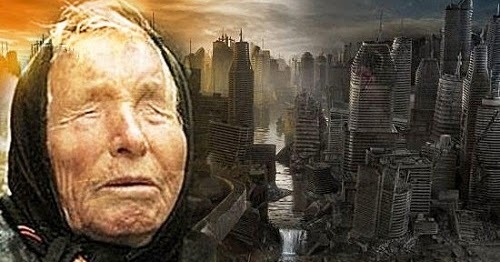 Vanga’s prophetic vision of the future was not necessarily a negative one. She perceived a possibility that there might be “a miracle and the whole world would win.” It appears that she was seeing a unification of world governments and world religions under a religious leader who would grant the world a time of peace and prosperity.” But she warned that to achieve this, “Humanity must recognize and accept the guidance of this Messianic personality,” she said. There are two ways that this grand future might come about, Venga warned. One involved a nuclear disaster causing death and destruction of most life throughout the Northern Hemisphere. She saw this event occurring sometime around 2014. She saw people all over the world suffering from some kind of skin disease. Would it be radiation poisoning? She also said the global ice caps would melt and the sea levels would rise. This is happening before our eyes. Other interesting predictions: A new energy source would be developed "out of nothing" and there would be an amazing achievement in the field of medicine. New bodies would replace the worn out ones. Eventually humans will turn themselves into living robots. This kind of advanced technology is also coming true. Vanga once said: "God is one and religions will soon find a common purpose and the whole humanity will come to believe one truth. Expect changes for the better, religions will unite, peace will be established on earth." She said people will then understand the existence of a spiritual world.